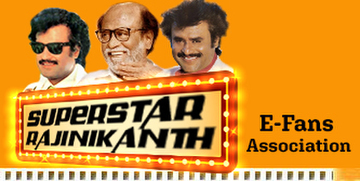 Most of you all knew that Rajini performed show in Singapore and Malaysia after the success of Baasha in 1995. Did you all know that Rajini did a guest performance before this function in Singapore? Yes, the show was performed in the year 1992 (just before the release of Paandian). This show was performed by Mrs Latha Rajinikanth and Rajini was the guest of honour for this show. This show was arranged by Indian Movie News (Well known cinema magazine in Singapore and Malaysia). The arrival of Rajini at airport was announced in radio and newspaper casually. Singapore Radio promised to give Rajini interview at the Airport. When the flight arrived, the organisers, media and Singapore Airport Personnels were shocked to see the huge crowd at the arrival hall with welcome paper cuttings. They didn't expect that much crowd and the airport officials were unhappy with the organisers for not informing them on the arrival of well known figure. Even the organisers didn't expect it too! Police were invited and they managed to calm the fans. After much discussion, the airport staff and police decided to use VIP exit to bring Rajini out of the airport. All the fans gathered at the airport were disappointed. Tamil Radio interviewed our Thalaivar in the car while driving towards the airport. Rajini was little tensed and he spoke little words. All the newspaper and tv channel including English channel covered his arrival news exclusively on the next day. The show was performed in Singapore Indoor Stadium which has 12,000 seating capacity. At that time, not much of NRI residing in Singapore and mostly local singaporeans occupied the hall. There were some Malaysians traveled all the way Singapore to see Rajini. Singaporeans love Rajini movies and they have not seen him in live shows or functions. They are thrilled and excited to see our Thalaivar live. They are ready to pay any amount even though Rajini is just a guest for this show (who is not going act or dance but confirmed that he is going to give a short speech). The tickets were sold few days before the show date. The show started with 2 songs from Mrs Latha but everyone's eyes were searching for one and one Thalaivar Rajini. Without any announcement, "Annanukku Jai, Thalaivannukku Jai" song from Murattukalai was played and superstar was carried by 4 persons to the stage. Everyone in the stadium was excited and stood to welcome our superstar with thundorous claps. Thalaivar waved hand to all the audience for few seconds and followed by that he was directed to be seatted in the first row. Mrs Latha Rajinikanth musical programme and Chinni Jeyanth comedy show went on for 2 hours and everyone were waiting for Thalaivar's speech. Finally, Mrs Latha announced that she will be singing all type of Rajini songs continously for 20 mins and the show will end with superstar's speech. The fans get restless and clapped for all the songs she sang. When she sang "Adikuthu Kuliru" from Mannan, she slowly walked towards Rajini and when the turn "Athu Sari Athu Sari" came, she just placed the mic to Rajini and he uttered "Athu Sari Athu Sari" with a shy smile. All the fans get excited and clapped. When Mrs Latha sang "Raakamma Kaiyathattu", she walked down the stage again and holded Rajini's hand and walked back to the stage. The song was going on and Rajini was standing in the stage with all the whistle and claps from the audience was going on. Mrs Latha and dance group were requesting Rajini to join them and he was little hesistant and shy. Out of sudden, he stylishly he spreaded his foot and started to do the dance movement, same like what he did in Thalapthy. That was really marvellous and everyone was thrilled and all stood whistled. He did it only for 15 seconds and the enjoyment they had at the moment was unexplainable. 1. Rajini commented about this show and informed that the show is little slow and it takes time between each song. It should be fast (takku takkunu pogannum) and should not drag it as it will make the audience to be bored. 3. His favourite politician was Singapore Prime Minster Lee Kuan Yew. After his speech, Rajini donated S$5,000 to National Kidney Foundation (NKF) and Mr Durai received on behalf of NKF. Very Good article... Enjoyed reading it. I like the way it is narrated. I feel like i am the one watching the show. Looking forward to this type of articles. Really interesting article and the video as well. first vdo speech was awsome. It make me to understand my self. thank u rajini heart touching speech.